Islamabad: Prime Minister Nawaz Sharif on Tuesday inaugurated a modern metro bus service in Multan, the main city in the southern part of Pakistan’s key province of Punjab, the political bastion of the ruling family and their party. 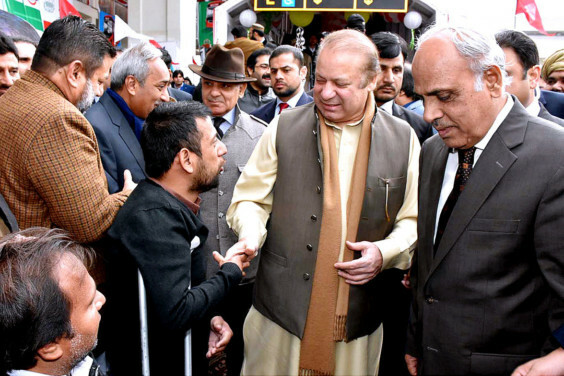 Sharif also took a ride on the metro bus service after the inauguration and, in an address to mark the occasion, told his opponents to come to Multan to see new Pakistan being built by his government, in contrast to the “anti-development, disruptive conduct” of his detractors. The 18-kilometre metro track begins from Multan’s Bahauddin Zakariya University, connecting 21 stations of which 14 are located at flyovers. The project was completed at a cost of 28.88 billion rupees (Dh1 billion). In the first phase, 35 buses will operate on the route — providing transportation to estimated 95,000 commuters daily. Metro bus services already operate in Lahore, the capital of Punjab province and between Rawalpindi and Islamabad. “Come to Multan if you want to see ‘Naya [new] Pakistan’”, Sharif said, adding that no one had thought of such projects before. Meanwhile in Islamabad, the Supreme Court was holding daily hearings into the Panama Papers case initiated on petitions seeking disqualification of the prime minister, filed by the opposition Pakistan Tehreek-e-Insaf party, Jamaat-e-Islami and a Muslim League faction. Addressing a large gathering after inaugurating the Metro bus project for Multan, Sharif said he believed in delivering real projects for the people and did not believe in selling half-baked ideas, for petty political gains. Sharif said the gathering was not for any sit-in, to disrupt any development project, block roads or level baseless allegations, but was to unveil a development project for the masses. He said those who claimed they were keen to build a new Pakistan should come to Multan to see in reality the new Pakistan. He said the city would soon be linked to the modern motorway network of the country that would help further boost the national economy. Sharif said a network of roads was now connecting all remote areas of Balochistan and would make travel safe, easy and cheap. He said all provinces would be connected through new road links.